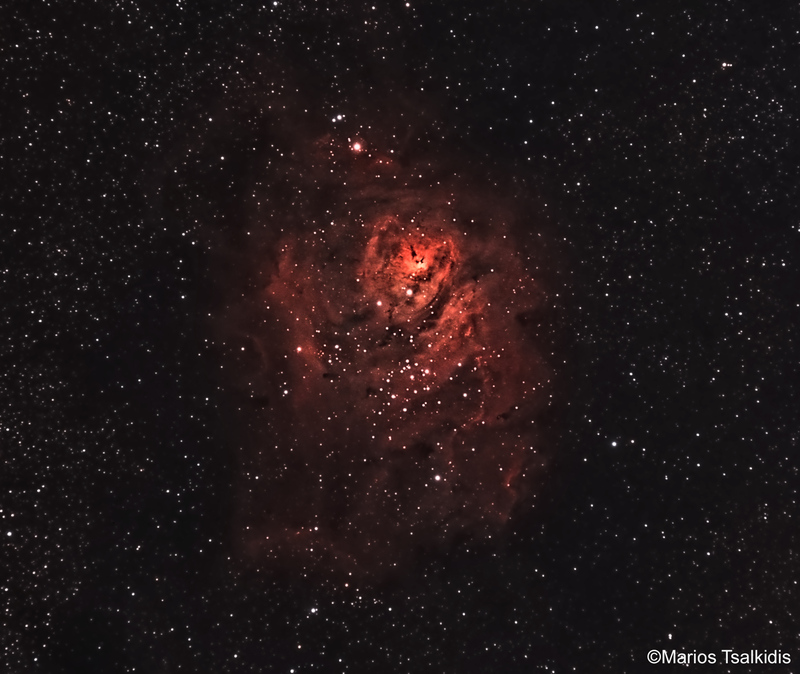 The beautiful Lagoon nebula was the first "successful" target taken from the light polluted Athens,Greece with the Skywatcher ED80 and a Canon 350D (modified IR filter). I was totally disappointed on my previous attempts due to a series of common for a newcomer to astrophotography, problems such as bad star tracking, light pollution, improper ISO settings etc etc. And then i found the Baader UHC-S filter. UHC-S filter is actually a 3to1 filter which combines the classical narrowband filters into 1 and thus can be really useful in light polluted skies for imaging nebulas. The first image into the small DSLR screen was a pleasant surprise : beautifully structured nebula popping out immediately instead of the "classic" sky glow which is the bane of light polluted sky photography! The Lagoon Nebula was discovered by Giovanni Hodierna before 1654 and is one of only two star-forming nebulae faintly visible to the naked eye from mid-northern latitudes. It is actually viewable with binoculars, and it appears as a distinct oval cloudlike patch with a definite core. In the foreground, one can see the open cluster NGC 6530. 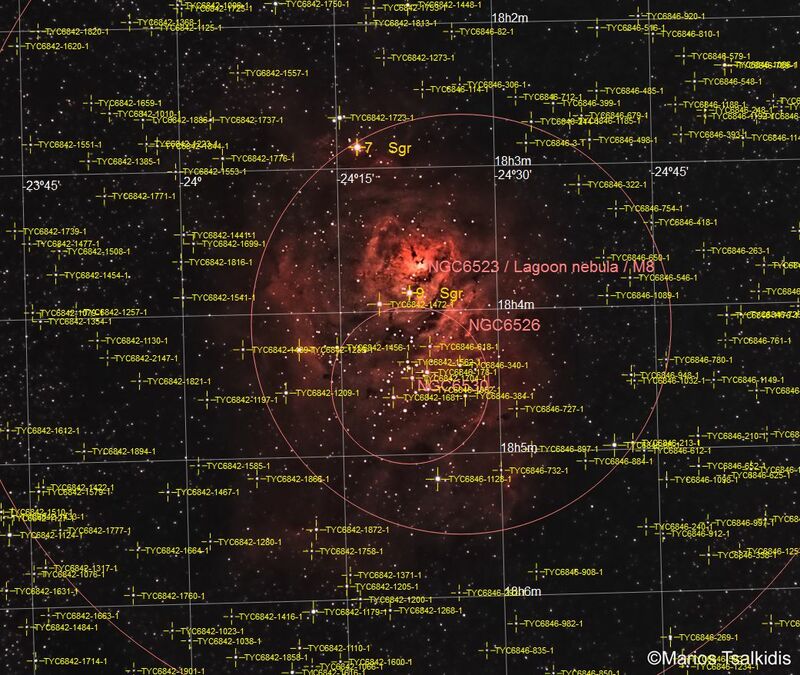 The Lagoon Nebula is estimated to be between 4,000-6,000 light years from the Earth. In the sky of Earth, it spans 90' by 40', translates to an actual dimension of 110 by 50 light years. Like many nebulas, it appears pink in time-exposure color photos but is gray to the eye peering through binoculars or a telescope, human vision having poor color sensitivity at low light levels. The nebula contains a number of Bok globules (dark, collapsing clouds of protostellar material), the most prominent of which have been catalogued by E. E. Barnard as B88, B89 and B296. It also includes a funnel-like or tornado-like structure caused by a hot O-type star that emanates ultraviolet light, heating and ionizing gases on the surface of the nebula. The Lagoon Nebula also contains at its centre a structure known as the Hourglass Nebula (so named by John Herschel), which should not be confused with the better known Hourglass Nebula in the constellation of Musca. In 2006 the first four Herbig–Haro objects were detected within the Hourglass, also including HH 870. This provides the first direct evidence of active star formation by accretion within it. Field of view ..... 1d 16' 16.1" x 1d 4' 17.4"
This image contains : NGC 6530, M 8, Lagoon nebula, Hourglass nebula, NGC 6523, NGC 6526, The star 9Sgr, The star 7Sgr for more details check the annotated version.